After getting beat by Ultraman, the bad guys need a vacation. Channel Fuji TV One is letting the monsters loose in a new travel program called “Ultra Monster Walk.” It will resemble other Japanese travel shows on which hosts visit a featured city’s landmarks, sample local cuisine and soak up the area’s flavor — but this version has a kaiju twist. 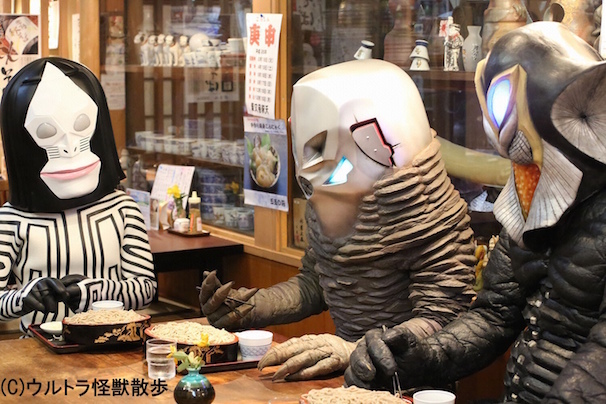 In the first out of 12 total episodes, scheduled to air on May 22 at midnight, the monsters invade, er, visit Yokohama and Kamakura. This isn’t the first time Ultraman’s enemies have taken a well-deserved rest. 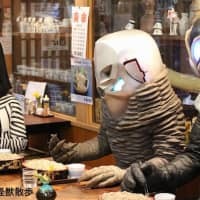 Last year saw the opening of Kaiju Sakaba, a Kawasaki restaurant-bar themed on the space monsters from the sci-fi TV series that invited visitors to share a pitcher with the costumed evil-doers. Even Ultraman has to take a break from saving the world once in a while. In May 2014, he flew to Hawaii to help promote Hawaii Tourism Authority’s travel packages. Ultraman even had enough time and money to bring the entire Ultra family to the islands as they tested the waters with surfing and whale watching. Maybe someday Ultraman and his enemies will bury the hatchet and they can all go on a relaxing trip together. Stay tuned.